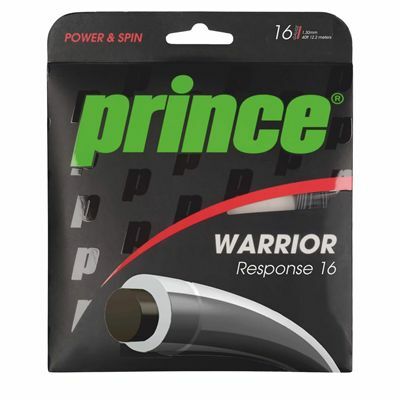 The Prince Warrior Response tennis string has been designed with intermediate and advanced players in mind and features a gauge of 16 (1.30mm). A hybrid in itself, the string offers a soft polymer centre core for excellent touch and comfort on volleys and the outer co-extruded polyester ensures a great combination of control and spin. This co-poly string comes as a 12.2m (40ft) set. for submitting product information about Prince Warrior Response Tennis String Set We aim to answer all questions within 2-3 days. for submitting product information about Prince Warrior Response Tennis String Set. We aim to answer all questions within 2-3 days. If you provided your name and email address, we will email you as soon as the answer is published. for submitting product review about Prince Warrior Response Tennis String Set.